Teacher planners with evenly spaced boxes are simply not helpful. Personalizing your teacher planner is easy, smart and SUPER effective! The Ultimate Weekly Planner is a teacher life-saver. I can’t imagine teaching without it. Lesson plan template, plan book, digital planner, teacher binder, weekly planning, weekly planner… whatever you call it – The Original Ultimate Weekly Planner is the simple, adaptable, customizable and completely editable plan book answer you’re looking for! Professional, gorgeous, and personal lesson plans are at your fingertips! The Original Ultimate Weekly Planner has been a TPT best seller for many years for some very good reasons. Better, far less expensive and much more customizable than online plan books and there are no yearly fees. It is useable and editable FOREVER! You will never need to purchase another planner as you can edit The Ultimate Weekly Planner to grow and change with you! New and different formatting choices are always at your fingertips. You can change your mind as often as you like! The Ultimate Weekly Planner is accessible from any device. So, if you don’t want to print your plans. You don’t have to. You can send your professional plans to resource specialists, teammates, administration and subs!! One of my favorite things about using The Ultimate Weekly Planner is I can access my plans from anywhere. SO, if I’m sick at 4am and need to make sub plans to send into my school’s secretary – it’s no problem! I can pull up my plans for the day and know what I have prepped in my room. Sub-plans done! If I’m not around a computer, no problem! I can look at my plans on my phone and tablet, too! You can use Microsoft Excel, Apple Numbers and Google Sheets to personalize, write and store your Ultimate Weekly Teacher Planner. Once you’ve created the template that suits your needs, you can choose to print it and use it with paper and pencil if you want. Or, you can use the plan book system included with the resource to store your plans. AND you can REUSE and edit your plans over and over again! The Ultimate Weekly Teacher Planner comes with detailed step-by-step instructions. Not only does this help you with initial quick set-up, it guides you through all you need to know to personalize the planner and make it suit your needs. You will also have access to extensive videos! The videos provide visual reinforcement and examples of all you can do to get away from the traditional boring boxes that work against you instead of with you! The guide and videos walk you through everything you need to know. It won’t be long before you realize the benefits of The Ultimate Weekly Planner over those expensive online planners and PowerPoint based planner and binders. Every part of The Ultimate Weekly Planner can be personalized. There are hundreds of templates. You could use and stick to one of them. They come in all sorts of color combinations and styles. You can also use the provided templates as a starting place and personalize your teacher planner to truly represent you and your busy day! Teaching is NOT a series of perfectly spaced boxes. Your planner doesn’t need to be either! This is MY personal planner. It is included as a bonus in the resource. Feel free to use it as is if it matches your day. BUT, you can also completely edit this file, too! The extras included with this resource can be pulled into your plan book digitally, printed, and even kept in their own digital file. They are all optional, come in a lot of choices including print size and color or black and white, AND are completely editable! Use your own fonts and clipart! Use your teacher binder at your next staff meeting! Create forms for classroom guests and subs. Track contact and communication regarding students. Store birthday information and keep and monthly calendar! You can also keep your standards on hand for easy reference and access to adding to your plans! ALL K-12 CCSS math and ELA standards are included. Extras come in both color and black and white. They are completely customizable. Already customized extras are included! Additionally, there are PRINT and GO extras included for those who do not wish to use these forms digitally! PLUS you can add any other extra you need! Do you like to keep a printed copy of your plans handy? I’ve been planning digitally for over 20 years, but I still keep a printed copy on hand. You have to keep those amazing plans and teacher binder pages in a beautiful home, right? There are more than 15 gorgeous customizable planner covers included! The Ultimate Weekly Teacher Planner makes planning easy and fast! 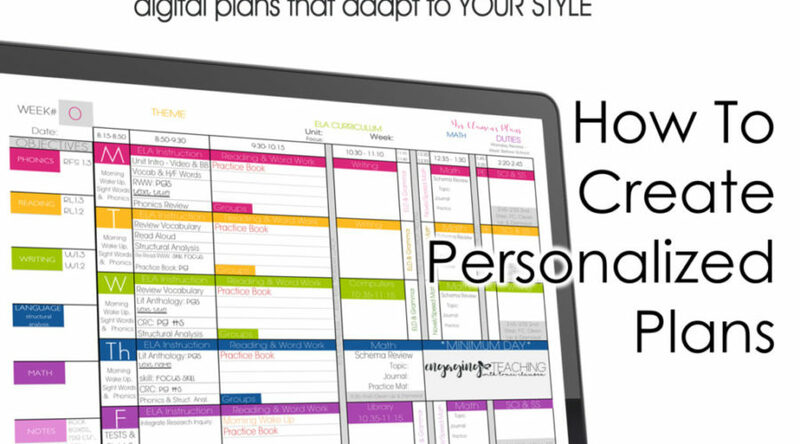 In the resource, I teach you how to customize the perfect planner for you. Your template will then make planning for the year SO SIMPLE! You’ll save tons of time and have a file filled with easily referenced plans – that you can use year after year! Or, you can start fresh each year – if you like the change! The choice is yours. Forever! You’ll never have to purchase another planner because The Ultimate Weekly Planner can be what you want it to be, year after year! Check out The Ultimate Weekly Planner video. The Ultimate Weekly Planner is your teacher planner solution! I’m ready to hold your hand and show you how! Don’t be afraid of Excel, Google Sheets or Numbers. They are not as complicated as they look and can do SO much more than PowerPoint! You can find it in my TpT Store available for Excel/Google Sheets, Numbers and BUNDLED with The Ultimate Year Curriculum Planner – The ultimate tool in backwards planning and another teacher organization MUST! What fonts are you us8ng? The planners come with basic fonts so that they are usable on any system. You can change the fonts to whatever you wish. I’ve also included customized pieces – and for those, I have listed the fonts used for each.